Highways 1 and 101 run alongside the full length of California's Pacific coastline, generally a few miles or less from the ocean apart from two extended sections where the roads move further inland - for 60 miles around Point Arguello, south of San Luis Obispo where much of the land is used by an air force base, and for 75 miles south of Eureka. 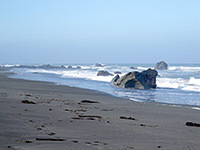 This northern region, mostly in Humboldt County, is known as the Lost Coast owing to its remoteness, inaccessibility and lack of settlement, and is claimed to be the longest section of undeveloped coastline in the whole USA (apart from Alaska), the main rival to this being Padre Island in Texas. The isolation is due to the high and steep-sided King Range, some peaks of which rise to 3,000 feet less than two miles from the ocean, sloping down abruptly to the coast and extending for many miles inland, as far as the redwood-lined valley of the Eel River, that provides a route for US 101. Along the 75 miles of the Lost Coast there are only two paved roads that reach the Pacific (see map); a dead-end route to Shelter Cove, and a road south from Ferndale which runs right beside the ocean for a few miles then provides another access point near Petrolia, at Mattole Beach. 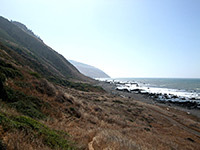 The wildest and most spectacular section is the 25 mile stretch between here and Shelter Cove, all of which can be seen via a backpacking trip on a long distance path (the Lost Coast National Recreation Trail) that runs partly over the grassy mountain foothills but mostly on the beach, across some places covered by the sea at high tide. 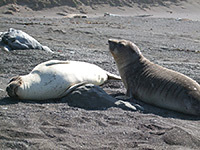 For day visits, the first few miles give a good introduction to the coastal scenery, as far as the disused Punta Gorda Lighthouse - the walk also passes narrow valleys, old cabins, volcanic black sand beaches, tide pools filled with much marine life, and isolated rocks in the ocean that are home to elephant seals and sea lions. Much of this stretch of the mountains and shoreline is protected as the King Range National Conservation Area, some parts of which can be reached by rough, unpaved tracks to high elevation trailheads, but the road from Petrolia is the main entry point. Most of the area is a federally designated wilderness. South of Shelter Cove, 13 miles of the coast is contained within Sinkyone Wilderness State Park, reached by a particularly winding unpaved road, and offering similar though more forested scenery, even less visited. Shelter Cove (population around 800) is the main settlement on the Lost Coast, and the 23 mile access road is relatively good, starting from Redway near US 101 and following a wooded valley for most of the way, but the two roads to Petrolia, though still paved, are rather more challenging and spectacular. The northern route (29 miles) is Mattole Road, starting at the historic Victorian town of Ferndale, at the south edge of the lower Eel River valley. This climbs a wooded hillside and right from the start is narrow, steep and bumpy, the surface in a bad state of repair. It curves through the forest across gullies and around hills, runs along a ridge for a few miles then emerges from the trees into open, undulating farmland, giving fine views over the King Range and glimpses of the Pacific Ocean far below. Next is a short but extremely steep descent, down 1,000 feet over two miles via several 10 mph bends to the tiny village of Capetown, along the Bear River; after crossing the river, the road climbs again through more woods to the top of the next ridge, crossing more deserted farmland and descending the far side of the hill to Cape Mendocino, site of a coast guard reservation. 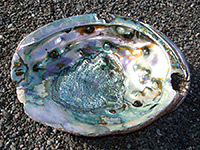 For 6 miles south the road is right along the coastline, passing a continuous dark sand beach strewn with large rocks. There are no houses at all here, but plenty of pull-outs and beach access points, maybe suitable for free camping. The road eventually turns inland, over less steep land towards Petrolia, which has a general store, inn, post office and a single pump gas station. The Lost Coast access is via the 5 mile Lighthouse Road, part paved, part gravel, alongside the wooded banks of the Mattole River and out to a camping/parking area at the edge of Mattole Beach. Back in Petrolia, the road is fairly wide and level as it continues southeast beside the river, to the next small town, Honeydew, where a lengthy, winding route heads south and links with the road to Shelter Cove. The other road out of Honeydew turns north, and provides the quickest way back to US 101; this is still Mattole Road, and soon has another very steep and twisting ascent, up 1,500 feet over the first three miles then is fairly level for the next few miles along a high, wooded ridge. It enters Humboldt Redwoods State Park and becomes generally wider, the curves slightly less sharp, though still quite winding as the highway makes a steady, continuous descent to the valley of Bull Creek, where the first redwoods appear. The remaining 7 miles to US 101 are level though rather narrow in a few places, especially through the main redwood forest (Roosevelt Grove) near the east end. 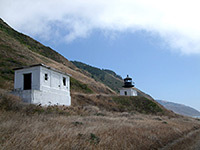 The Lighthouse Road from Petrolia to Mattole Beach ends at a small, BLM-managed primitive campground, which is apt to be full at busy times of the year, is regularly patrolled by rangers and requires a fee of $8 per night, so this is not quite the tranquil, regulation-free location that might be expected, but the site is pleasant enough. A narrow range of sand dunes keeps the ocean out of sight but not out of hearing, as big, booming waves constantly crash against the beach just beyond. Beside the campground is the day use parking lot, rest rooms, trailhead and information board with camp rules, maps, tide tables and various warning notices, particularly regarding the dangers of being cut off by the tide along some sections of the Lost Coast Trail, which heads south along the coast all the way to Shelter Cove. Mattole Beach campground also has tables, drinking water and fire rings, with plenty of driftwood available for burning. Dispersed primitive camping is allowed anywhere along the beach, with a (free) permit. Description of the first five miles of the Lost Coast Trail. Eureka and Fortuna are the only nearby towns with chain hotels.